The power of Positive Yelping! Yelp, the user-generated business review site, has drawn both admiration and ire since it began. Personally, I’ve been a devoted Yelper and Yelp Elite member since January 2007. There’s one review I’m particularly proud of that I’m sure will never gain that distinction, but as of yesterday it gained the best unintended praise I could ever have hoped for. Photo courtesy of Hellenic Communication Service. Photos by New Hampshire Public Radio on Flickr. View their full set of photos here. It is one of the most ornate and beautiful Orthodox churches ever made. 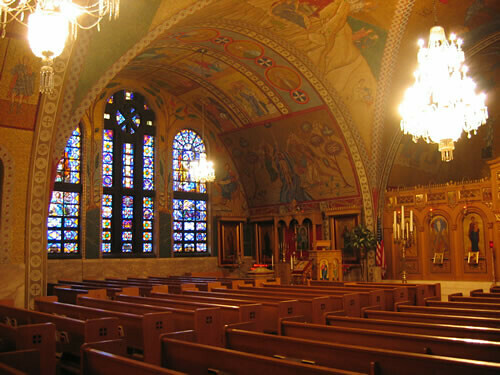 Wall-to-dome, it is covered in handmade glass and gold mosaic Byzantine iconography. My review goes into detail about this — you can read it here. 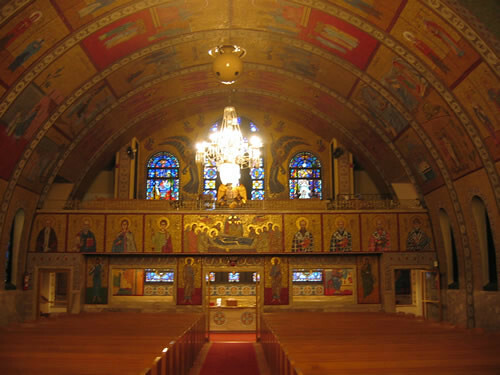 My home church is a treasure of Byzantine art and you’d never know it from looking at it from the outside. It’s located in a rough neighborhood of Lowell, and the exterior yellow brick is rather unassuming. Apparently someone from my home church found my review on Yelp (or they found it via their daughter — I’m still not entirely sure), and from there things spread like wildfire — the link was passed around to the current Transfiguration priest and then on to the iconographer himself, whose work I can’t praise enough. When I wrote that review several years ago, my hope was that it’d pique the curiosity of folks who might attend the church’s annual food festival and–instead of making a bee-line straight for the souvlaki and spanakopita–might opt for a church tour as well. Somehow it’s all come full circle. Kind of blows my mind! New Hampshire Public Radio did a fantastic story on the Transfiguration church, specifically the work of the amazing iconographer Robert J. Andrews. Read the story here. –or you can download the mp3 of the story itself.